As far back as I can remember, my love for burgers started on that one tiring afternoon. I was wandering on the streets of Quirino looking for a job. Many hours passed, still no luck. I became very hungry. There were lots of food chains around but my taste buds found their menu (not the paper) too familiar. Then, I saw a new signboard that read: Backyard Burger. Within a few minutes my burger was served. Then it was just me and the BB Signature Burger. The Burger’s meat looks very good. The buns were unique; there were healthy black Sesame seeds on top of it. The vegetables were a perfect picture of freshness. It was a beautiful portrait of how a burger should look like. Seriously! The patty was sumptuously grilled and the cheddar cheese, oh how it creamily melted inside my mouth. While the lettuce made crispy musical notes, I felt those flavorful buttered garlic mushrooms dancing. The bacon and Yakiniku, they were perfect! Then suddenly, a sweet tangy splash inside my mouth – yes, it’s the tomatoes and onions oozing with their fresh juices! 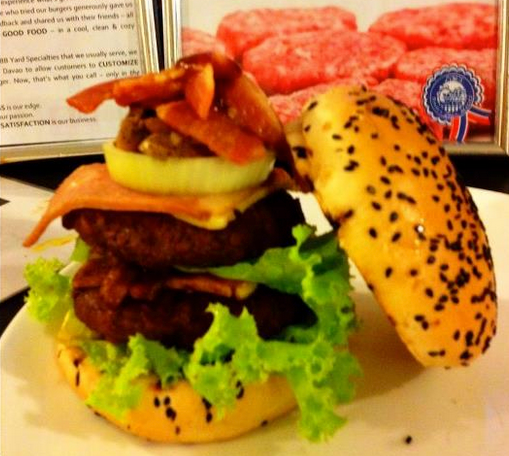 If you want to know what I mean then, visit Backyard Burgers at Ecoland Phase 1 or Elpidio Quirino Ave, Davao City. ← How do you like your Burgers?